WELL DONE! : Tan (seated, second right) with 16 of the 7As scorers and the school board of management committee members. Seated at third right is the board chairman, Lee Chung Seng. MIRI: Sekolah Jenis Kebangsaan Cina (SJKC) Chung Hua Miri performed well in the Ujian Peperiksaan Sekolah Rendah (UPSR) as expected, scoring a 61.69 pass rate. This was a significant increase compared to the 60.8 per cent pass rate last year, said acting headmistress Tan Ai Chu. “Our best subjects are Mathematics and English with an increase in the overall pass percentage,” she told The Borneo Post at the school yesterday. A total of 295 candidates sat for the examination. Out of the number, 19 pupils scored 7As, 23 scored 6As, 20 scored 5As and 28 scored 4As. The 7As scorers were Angeline Tang Shi Shi, Eddie Chung Di Wei, Eleazar Lejau Philip, Jacqueline Kiu Ming Jiet, Janice Chong Wan Jing, Jong Zhuo Ying, Lim Geok Leng, Marcus Liu Zi Xian, Marina Wong Mei Ing, Melissa Wong Ling Chee, Tiffany Lau Yee Nee, Wendy Sung Sing Jie, Yong Zheng Xue, Yuki Wong Wen ting, Yvonne Teo Li Ying, Angeline Liew Yu Pei, Lau Zheng Yue, Lui Man Yan and Tang Shan Yuan. Tan attributed the improvement to the extra classes held, daily morning readings and adoption programme where teachers focused on pupils weak in certain subjects. 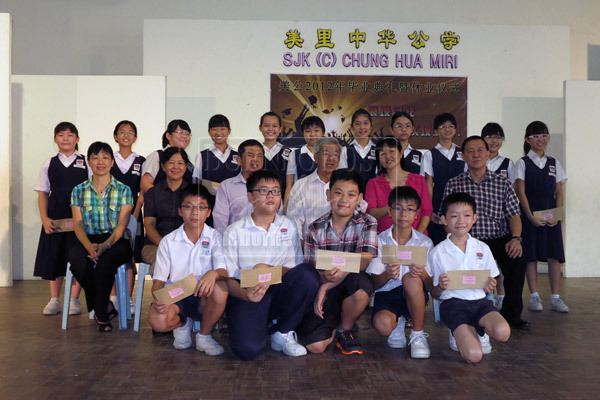 Meanwhile, SJKC North Miri produced two pupils scoring 7As, two 6As, six 5As and four 4As. The 7As scorers are Kevin Tang and Houng Nai Yuan while Liew Sze Nee and Ngu Chun Lian scored 6As. Senior assistant to the headmaster, Luk Key Ting, said112 candidates sat for the examination, compared to 83 last year. Last year, the school produced six 7As scorers. The senior assistant said they did not score in Bahasa Malaysia and English but the school would work out an effective strategy to improve in future examinations.